I am smack dab in the middle of my first trial using Facebook Offers to drive repair order counts at one of our stores. My guinea pig is our Honda of Ocala dealership. 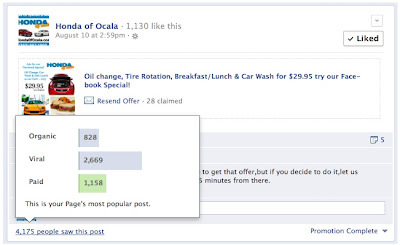 I am using Honda of Ocala cause we are smack dab in the middle of a car giveaway as well and that Facebook page has quite a bit of new fans (many not our core customers) and lots of activity. The offer we chose was one that had done well in previous mail outs. I wanted to make sure that the offer would never be in question only Facebook's ability to get customers attention and to get to try our service center. One thing I have realized is that with our mail outs we had more of a captive audience: our past customer. Also most of that audience was familiar with our location and more than likely still owned a Honda vehicle. On Facebook especially within the contest of our Civic giveaway we have less than a focused target. Our Facebook fans (knowing 70% of our fans had come in the last 30 days) more than likely drove other makes and models. What I am getting to is that perhaps our offer could have been more focused on those that drove other makes outside of the Honda brand. Also a more inexpensive offer with less bundled "features" may have been a better approach. So moving forward our next offer may be simplified at a lower price point with a focus on non-Honda customers. The offer was built as our "Facebook Special" and was "re-shared" across our platform each day and promoted as well for $5.00. We decided to promote the ad so that "friends of our fans" would have exposure to the ad as well. We created a separate operation code for our DMS system and began the offer on Friday August 10th at around 3pm. While it is only Tuesday of the following week and we only have around 5 coupon redemptions it's probably not too early to look at the success of the campaign from an impressions and "claimed" standpoint. Our most successful post was our first "Offer launch" on the 10th. As of today we have had 828 organic impressions through our timeline. We have a little more than 1100 Facebook fans but this seems to be a good number. The key here is seeing over 2,600 "Viral" shares meaning that our fans shared the offer to their friends. This increasingly supports the notion that people can and will use Facebook to seek and find offers much like a Groupon or discount website. The remaining impressions were 1150 some "paid" and supported listings working out to about 4,655 total post impressions. As of current date (5 days after launch) we have 33 offers claimed with a combined reach of 8,558 and 87 Engaged Users and 65 Clicks resulting from low cost promotions. Total dollar amount spent $30.55 in promoted ad spend. Conclusion will have to wait to see who has actually come into our facility off the offer but so far Facebook looks like a viable campaign medium for our Service department.